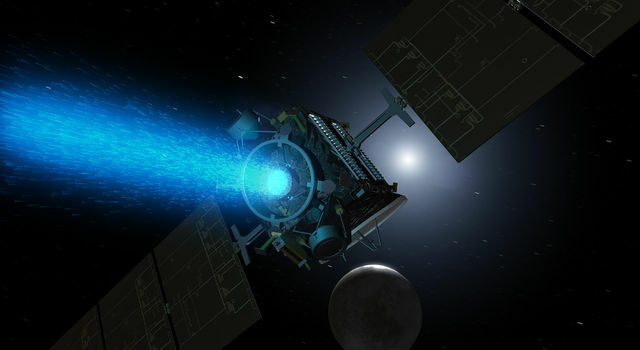 Deep in the asteroid belt, Dawn continues thrusting with its ion propulsion system. The spacecraft is making excellent progress in reshaping its orbit around the sun to match that of its destination, the unexplored world Vesta, with arrival now less than five months away. We have considered before the extraordinary differences between Dawn’s method of entering orbit and that of planetary missions employing conventional propulsion. This explorer will creep up on Vesta, gradually spiraling closer and closer. Because the probe and its target already are following such similar routes around the sun, Dawn is now approaching Vesta relatively slowly compared to most solar system velocities. The benefit of the more than two years of gentle ion thrusting the spacecraft has completed so far is that now it is closing in at only 0.7 kilometers per second (1600 mph). Each day of powered flight causes that speed to decrease by about 7 meters per second (16 mph) as their orbital paths become still more similar. Of course, both are hurtling around the sun much faster, traveling at more than 21 kilometers per second (47,000 mph), but for Dawn to achieve orbit around Vesta, what matters is their relative velocity. It may be tempting to think of that difference from other missions as somehow being a result of the destination being different, but that is not the case. The spiral course Dawn will take is a direct consequence of its method of propelling itself. If this spacecraft were entering orbit around any other planetary body, it would follow the same type of flight plan. This unfamiliar kind of trajectory ensues from the long periods of thrusting (enabled by the uniquely high fuel efficiency of the ion propulsion system) with an extremely gentle force. Designing the spiral trajectories is a complex and sophisticated process. It is not sufficient simply to turn the thrust on and expect to arrive at the desired destination, any more than it is sufficient to press the accelerator pedal on your car and expect to reach your goal. You have to steer carefully (and if you don’t, please don’t drive near me), and so does Dawn. As the ship revolves around Vesta in the giant asteroid’s gravitational grip, it has to change the pointing of the xenon beam constantly to stay on precisely the desired winding route to the intended science orbits. Dawn will scrutinize Vesta from three different orbits, known somewhat inconveniently as survey orbit, high altitude mapping orbit (HAMO), and low altitude mapping orbit (LAMO). Upon concluding its measurements in each phase, it will resume operating its ion propulsion system, using the mission control team’s instructions for pointing its thruster to fly along the planned spiral to the next orbit. Dawn’s winding orbital path obeys the same rules. The lower the orbit, the faster and tighter the spirals, because the orbital velocity is greater. The first few coiled routes around Vesta this summer will be long and slow, taking days to complete. When it is at the lowest altitude, where each orbit takes only four hours, the spirals will be that much faster, so the craft will have to steer with greater agility to synchronize its ion thrusting with its rapidly changing location. In its interplanetary travels, spiraling outward from the sun to reach Vesta, each loop takes years to complete, so Dawn has not yet had to steer through any tight turns. The direction it aims the operating thruster hardly moves at all during a full week of thrusting. Pointing a thruster in the direction needed to spiral around Vesta requires turning the entire spacecraft. Each thruster is mounted on its own gimbal with only a very limited range of motion. In normal operation, the gimbal is aimed so that the line of thrust goes through the center of the ship. When the gimbal is swiveled to a different direction, the gentle force of the thruster causes the ship to rotate slowly. This is similar to the use of an outboard motor on a boat. When it is aligned with the centerline of the boat, the craft travels straight ahead. When the motor is turned, it continues to propel the boat but it also turns it. (Most jets, in contrast, do not alter the direction of their thrust to turn but rather use other means.) In essence, Dawn’s steering of its thrust is accomplished in large part by pivoting the thruster itself. A crucial difference between the boat and our interplanetary ship is that with the former, the farther the engine is turned, the tighter the curving course. For our craft, the gimballing of the thruster needs to be carefully coordinated with the orbital motion, as if the motorboat operator needed to compensate for a constantly curving current. This has important implications at Vesta. Sophisticated as it is, Dawn knows where it is in orbit only by virtue of information mission controllers install onboard to predict where it will be at any time. That is based on their best computations of Vesta’s gravity, the planned operation of the ion propulsion system, and many other considerations, but it will never be perfectly accurate. Let’s take a look at some of the reasons. Vesta is a member of the elite family of rocky, terrestrial planets that live in the inner solar system. Just as its kin, Mercury, Venus, Earth, the moon, and Mars, have complex gravity fields, it is likely Vesta does as well. The distribution of materials of different densities within the interior creates variations in the strength of the gravitational force, so Dawn will feel a slightly changing tug from Vesta as it travels in orbit. Our ship will be traversing unknown, choppy waters. In December, we saw that by sensing the irregularities in the gravity field, Dawn will reveal the nature of Vesta’s internal structure. Until those detailed measurements have been made and accounted for in the design of the flight plan, however, the subtle effects of the gravity field will cause deviations from the planned trajectory. Therefore, as the spacecraft travels from one science orbit to another, it will thrust for a few days and then stop to allow navigators to get a new fix on its position. As it points its main antenna to Earth, the Doppler shift of its radio signal will reveal its speed, and the time for radio signals (traveling, as all readers know so well, at the universal limit of the speed of light) to make the round trip will yield its distance. Combining those results with other data, mission controllers will update the plan for where to point the thruster at each instant during the next phase of the spiral travel, check it, double check it, and transmit it to the distant explorer which will put it into action. This intensive process will be repeated every few days as Dawn maneuvers between science orbits. The as-yet uncharacterized details of the gravity field are not the only reason the flight plan will require regular adjustments. As the ion propulsion system will be changing the orbit, even tiny deviations from the calculated thrust eventually will build up to have a significant effect. This is no different from any realistic electrical or mechanical system, which is sure to have imperfections. If you planned a trip in which you will drive 100 kilometers (62 miles) at 100 kilometers per hour (62 mph), you could expect you would arrive in exactly 60 minutes. But even if you maintained the speedometer as close to 100 as possible, it would not be accurate enough to indicate the true speed. If the actual speed averaged 101 kilometers per hour (63 mph), you would arrive about 36 seconds early. Perhaps that difference wouldn’t matter to you (and if it did, you might consider replacing your car with a spaceship), but such tiny errors, when compounded by Dawn’s repeated spirals around Vesta, will make a difference in achieving its carefully chosen orbit. Still other phenomena contribute to minor differences between the flight plan controllers send to the spacecraft and what actually occurs. Two of these, the slight force of sunlight on the probe and the larger perturbation from the occasional firing of the small jets to reduce the spin rate of the reaction wheels, were explained in some detail in a previous log, and both will play a role at Vesta. The mission control team has devised strategies to accommodate all these tiny contributors (and others) to deviations from the plan. An additional component of preparing for the intricacies of Vesta operations is establishing how accurately Dawn can perform the team’s masterful choreography. It has repeatedly proved that it can execute the slowly changing profile of interplanetary cruise. For the more challenging case of orbiting its protoplanetary destinations, engineers have developed mathematical models and conducted studies with the spacecraft simulator at JPL, but to verify that the results are valid, a test this month of the ship’s ability to steer through some maneuvers was deemed worthwhile. Just as with the activities it practiced in January, the robotic explorer performed very well indeed on its latest demonstration. Although it is not in orbit around Vesta now, operators commanded Dawn to aim its thruster as it will near the end of the transfer from HAMO to LAMO. For the equivalent of one and a half spiral revolutions (the duration being adequate to assess all the pertinent aspects of the maneuvering), the spacecraft rotated using its thruster, changing the direction of its ion beam in much the same way it will when it is lowering its orbit. Because Dawn will be farther from the sun at that time in the mission than it is now, this trial run used a lower ion throttle level (and hence lower thrust), reflecting the reduced solar power that will be available. The results confirmed that the spacecraft’s operation matches the mathematical predictions and that the ongoing preparations for these elaborate flight profiles are sound. Although more work remains, the success of this test is a valuable step in becoming ready for reaching the intended orbits around Vesta. When Dawn has completed its work in LAMO, it will reverse its spirals and begin climbing away from the world it has been studying. 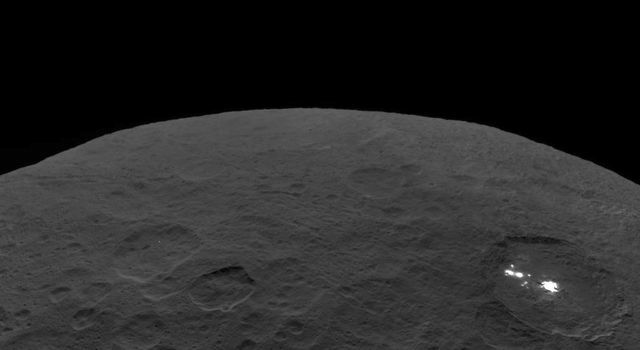 It has an appointment with dwarf planet Ceres, so it cannot linger at Vesta indefinitely. Nevertheless, the itinerary allows for the traveler to stop for three weeks at an altitude of about 660 kilometers (410 miles). At the same height as HAMO, this orbit is innovatively named HAMO2. Although there are some differences in the orbital geometry, the principal distinction between HAMO and HAMO2 is that they are separated by about eight months, during which Vesta (with Dawn in tow) will have progressed in its orbit around the sun. As we noted during Earth’s most recent northern hemisphere autumn, Vesta has seasons, and the changing angle of the sunlight on the surface of that alien world during Dawn’s residence there affects its appearance and how much of it is visible to some of the science instruments. 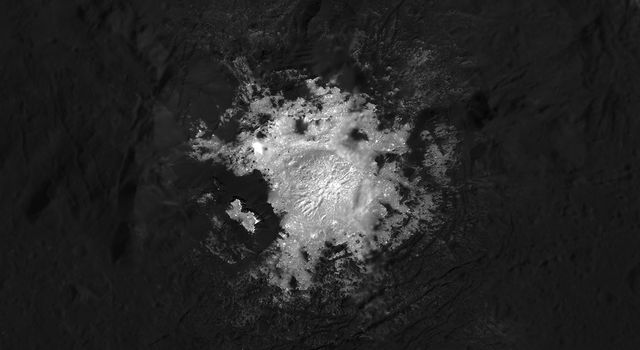 Because more of the northern hemisphere will be illuminated, HAMO2 affords the opportunity to see previously hidden landscapes and to gain a new perspective on some terrain observed earlier. From Dawn’s perspective now, its destination already glows bright. By the middle of March, Vesta will easily outshine all the objects in the adventurer’s sky save the sun. If you take a moment to enjoy the view of Jupiter low in your western evening sky, it will appear about as bright these days as Vesta would for Dawn. But even as Jupiter sinks toward the sun and becomes more difficult for terrestrial observers to see, the point of light in our remote probe’s sky grows ever more luminous as their separation shrinks. For those on Earth who want their own perspective on the locations of Dawn and Vesta, the changing solar system alignments will help. This summer, just as our planet’s robotic emissary is getting settled in orbit and beginning its survey, Vesta will be easily visible with binoculars and may even be detected by keen, unaided eyes under dark skies, although its visitor from Earth will be quite imperceptible. In a few weeks, when the moon will be visible at dawn and for much of the first half of the day (regardless of your time zone), you can use it as a guide to the approximate location of Dawn and Vesta. Between about 2:00 PM PDT on March 27 and 10:00 AM PDT on March 28 (the day before the 204th anniversary of Vesta’s discovery), both distant inhabitants of the asteroid belt will be less than 5 degrees from the moon. (For reference, 5 degrees is 10 times the diameter of the moon or about the width of three fingers held together at arm’s length.) You won’t need binoculars or a telescope to see them; you need only your imagination to reveal a distant ship, far from the port from which it set sail more than three years ago. In the silent depths of space, with a faint blue-green trail of xenon ions behind it, the craft will be closing steadily on a mysterious, ancient world that soon will reveal exciting and fascinating new vistas as it bears witness to the very dawn of the solar system. Dawn is 4.2 million kilometers (2.6 million miles) from Vesta, or 11 times the average distance between Earth and the moon. It is also 2.56 AU (383 million kilometers or 238 million miles) from Earth, or 970 times as far as the moon and 2.59 times as far as the sun. Radio signals, traveling at the universal limit of the speed of light, take 43 minutes to make the round trip.